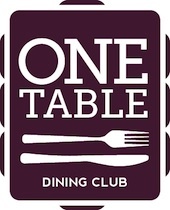 Chris Caudle runs the ONE Table Dining Club, arranging regular dinners in Soho. Last year there were four; the next is happening at the end of April. The venue is like someone's home, with two big dining tables and an open plan kitchen, music and a relaxed and convivial atmosphere.